Dementia is a disease that affects millions of people across the globe every year. It is often a highly misunderstood condition that is marred by numerous misconceptions, which make the condition difficult to understand and study. You should know that dementia is not a name for an illness, rather it is a collective term that describes a broad range of symptoms that relate to declining of thinking, memory, and cognitive skills. These symptoms have deteriorating effects that usually affect how a patient acts and engages in the day-to-day activities. In advanced dementia stages, affected persons may experience symptoms that bring out a decline in rational thought, intellect, social skills, memory, and normal emotional reactivity. It is something that can make them powerless when it comes to living normal, healthy lives. 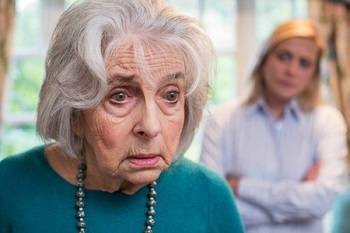 Relatives, caregivers, spouses, siblings, children and anyone close to a person who has dementia need to know how to deal with behavioral problems that surface because of the illness. Examples of dementia problems may include aggressiveness, violence and oppositional behaviors. Find out some of the vital Do and Don’ts when dealing with a dementia patient. After spending some time with a patient who has dementia, caregivers may be in a position to identify some of the things that make dementia sufferers yell, get physical, or change their mood. For some, it may be something simple such as taking a bath or even getting dressed. The best approach to handle this is not to force the patient to do something that they do not want to do. Try and distract them with something else that allows them to relax and calm down. Once they are not a danger to themselves or anyone around them, try going back to the subject, but this time reassuringly and calmly. Communicating with a dementia patient requires a lot of patience, especially during later stages of dementia. It is vital to ensure that you talk in a place that has good lighting, a place that is quiet and without too many distractions. Do not try and stand over the person you are talking to, but rather try to be at their level and keep eye contact at all times. Take care to make sure that body language is relaxed and open. Prepare to spend quality time with the person so that they do not feel rushed or like they are a bother. It does not matter how many times you have to do it. Dementia comes with memory loss which means that the patient may forget your name. When starting a conversation always remind them your name and tell them something nice that will make them smile. Scientists state that habits belong to their own memory structure, which remains intact for long periods even when the patient loses their most recent memory skills. Routine helps dementia patients to know what to do on a daily basis. Caregivers should strive to include meaningful activities in the routine for as long as possible as a way of ensuring that the person with the condition has a sense of independence and purpose in life. Remember to continually re-examine the routine to remove things that may agitate, depress or make the dementia patient feel unsettled. Sadly, it may reach a point where people with dementia may not be able to keep up with a basic routine. However, as long as they still can, be sure that they do things every day that make them happy. Many times, people with dementia may experience feelings of isolation, fear, loneliness or confusion. They may not be able to express this in the right way and thus may wander off or keep saying that they want to go back home, especially if they are in a senior living facility. This is not the time to shut them out. It’s a good idea to assure them that they are safe and in a good place. If you are close enough, provide a comforting hug every once in a while and remind them that they are in a place that has their best interest at heart. Where possible, engage in exercise or take a walk as even light physical activity may help to reduce agitation, restlessness and anxiety. Fatigue, hunger and thirst may cause combativeness. Ensure that the person with dementia is well fed, hydrates enough, and gets adequate sleep and rest. In line with this, they should also have enough bathroom breaks. Research also shows that it may help to reduce loud noises as well as clutter in the space where the patient spends most of his/her time, as both loud noises and clutter tend to over-stimulate people with dementia. At times, the behavior that dementia patients exhibit is because they are missing a person or place they love. Experts suggest for caregivers to go through as many photos as possible with the person with the illness. It is a tool that helps to stimulate happy memories while the dementia sufferer goes down the memory lane. Going through family photos has been known to play a significant role when it comes to the patients remembering the pleasant times they had. Family photos also help people with dementia to remember special people in their lives. It is best to use large pictures that have clear labels because many people who have dementia often have declining or poor eyesight. Try and select meaningful moments, and you can also make it an activity where patients can create scrapbooks with the people they love. Caregivers are also humans who are prone to emotions like anger, stress, impatience, and irritation. Even when one goes through caregiver burnout, it is best that the patient does not get wind of it. It is better to step out of the room and try some breathing exercises to calm down before going back to deal with the dementia patient. Where possible, shelve the “bad” feelings and try and deal with them later. Dementia patients deal with a lot and they do not need more on their plate if they are to lead fulfilling and happy lives. Do not forget that dementia is the condition that results in irrational behavior and causes dementia sufferers to act the way they do. The patients demand plenty of patience and forgiveness from the people looking after them. Have the heart to let things go instead of carrying grudges around for something that the patient may not be in control of. One of the worst things a person can do to an individual who has dementia is to start an argument or even force them to do something that makes them upset or angry. When the discussion or argument is too heated, it may be better to walk away to create an environment where everyone can remain calm. Experts agree that one of the ways that can yield results when it comes to dementia behavior problems is to get rid of the word no when dealing with patients. Avoid forcibly restraining a dementia sufferer at all costs. Communication and language often become difficult over time for individuals who have dementia. It is therefore very important to use polite language when speaking with someone who has dementia. Do not use sharp or threatening voices. Do not feel frustrated when you have to repeat words or phrases several times because the person you are conversing with does not catch them or understand as fast as they should. Restrain from ridiculing or patronizing the patients about what they say. People with dementia do not like it when someone keeps correcting them every time they say something that may not be right. It makes them feel bad about themselves and can make them drift out of the conversation. Discussions should be humorous and light and one should always speak slowly and clearly using simple and short sentences to capture and keep the interest of the dementia patients. When looking after persons with dementia, practicing self-control is of utter importance. Learn how to breathe in and just relax without taking things personally or getting angry and upset. Remember that dementia patients do not act the way they do out of their own accord. It is the illness that makes them behave the way they do. Lack of understanding may push one to try and change or stop any undesirable behavior from patients who have dementia. Keep in mind that it is almost impossible to teach new skills or even reason with the patient. Try instead to decrease frequency or intensity of the behavior. For instance, respond to emotion and not the changes in behavior. If a patient insists on always asking about a particular family member reassure them that he or she is safe and healthy as a way of keeping them calm and happy. Staying in one place for long periods may result in behavior problems in the dementia patient. It is essential to have a safe environment where they can enjoy the outdoors without any problem. When someone tries to leave a room, do not force them to stop. Doing this may result in an extreme reaction such as severe distress or injuries. Instead, it is best to accompany the patient so that they are safe. You can even suggest going for a drive around the block so that they can experience a new environment for a short period. If they do not want company, just let them go but stay close by to make sure that the patient is safe at all times. It helps to have an open mind when dealing with an individual who has dementia. Try and keep up with their pace without having to rush them too much. It is advisable to avoid trying to teach new information or ask the affected individuals to do something that they have not previously done. No one may have all the answers especially when it comes to taking care of a person with dementia. Try doing research on how their behavior changes and what needs to be done to help them live their lives without too many complications. Hire help when it becomes too much as it also ensures that you do not become too frustrated or drained. When you have multiple family members who can help, ask everyone to pitch in and look after the patient so that you can get some personal space to breathe and re-energize when it is your time to look after the patient. When you feel like you can no longer look after your loved one at your own home, it may be time to consider assisted living. In such case, look into dementia care homes that can provide specially trained professionals. When a dementia patient becomes aggressive or agitated, try to remain in control without breaking down, panicking and using physical force. Try other approaches that may help to make them calm. These can include holding their hand firmly but gently, singing them their favorite song, or patting their pack gently. Note that some people do not like to be touched; thus, it is best to give them some space by sitting away from them or leaving the room until they calm down. As much as one needs to be tolerant, kind, forgiving, and patient with older adults who have dementia, it does not mean that they have to excuse the patients when they become physically aggressive and allow the abuse to continue. It is not to be accepted, and if it happens, it is best to alert your doctor who will work on the solution to make sure it stops. It will keep both the patient and caregiver in safety. From physical manifestations to angry outbursts, taking care of an individual with dementia may not be easy. However, working with the tips above can help caregivers and loved ones to get through it. Remember that there are plenty of treatments, interventions and special care providers who can help; therefore, you should never be shy about getting help when you need it.